Quite often there is a situation when the backup is performed on Windows Server by using standard tools. Of course, the size of network folder is limited and standard tools are not able to delete backups older than a certain age. This situation can be solved by using PowerShell scripts. If you are still using the .bat scripts, just note how PowerShell scripts are easier and more logical. You don’t need to delete everything to do backup. Just delete the folders with Backup %date% names. Please note that Remove-Item requests a confirmation for automatic agreement. So we don’t need to use –Confirm:$false and/or –Force flags. In our case we should use the –Recurse flag. If you want to delete the backups that SQL server makes, you don’t need to delete the folders. Just delete the files from the folder (it’s no sense to specify file mask, because that folder has only .bak files). You need to know that all backups performed by using standard tools are placed in a local folder, where they stored for some time, and then transfer to the archive. If you want to store backups in a few places, they can be copied by using the Copy-Item command. Here is an example, where only fresh backups will be copied. You can copy Windows Server backups in the same way (the folders will be overwrite). To back up the Hyper-V virtual machines, you should use HVBackup. You can copy these backups to another location in the same way as SQL backups. 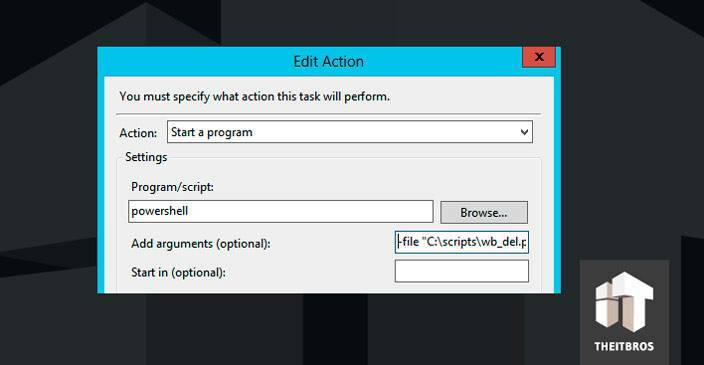 These and other scripts can be folded in C:\Scripts folder and executed automatically by using Set-ExecutionPolicy RemoteSigned and Task Scheduler. To use these scripts automatically just open up Action settings. 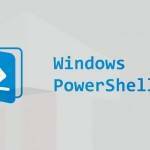 Specify Powershell as a Program/script and the path to the scripts as arguments. Please note that this particular case should be used in the test environments or in the real environments of the small or very small companies. In other case you have to use special software like System Center Data Protection Manager.